For this project, I designed two bibliographic instruction tools that were meant to help my students along with their research and their writing. 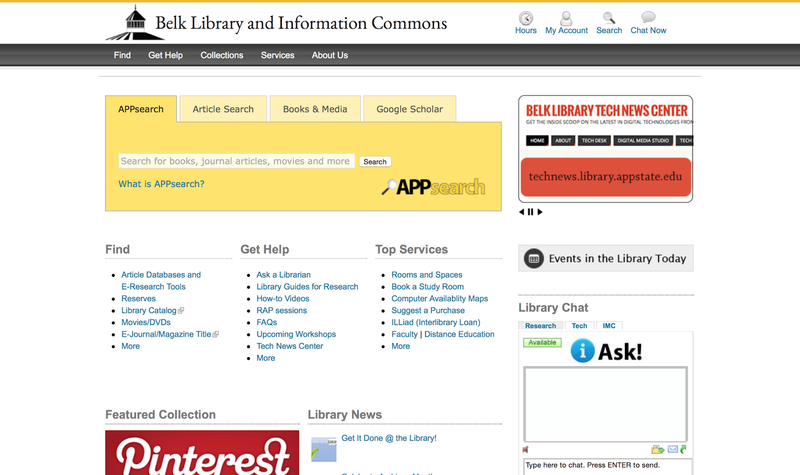 After speaking to my students, I realized that they had no idea how to use the databases through the Belk Library. 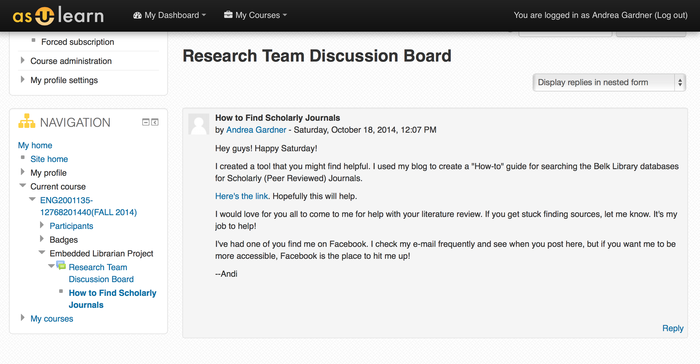 Because of this, I decided to create a step-by-step blog to show them how to find scholarly journal articles. In conversation with my students, I realized that they also had no idea how to appropriately cite these articles in their research paper. Instead of having to dig through the vast resources online that teach you how to use APA formatting, I decided to create a tool that would show students how to cite scholarly articles within their paper. 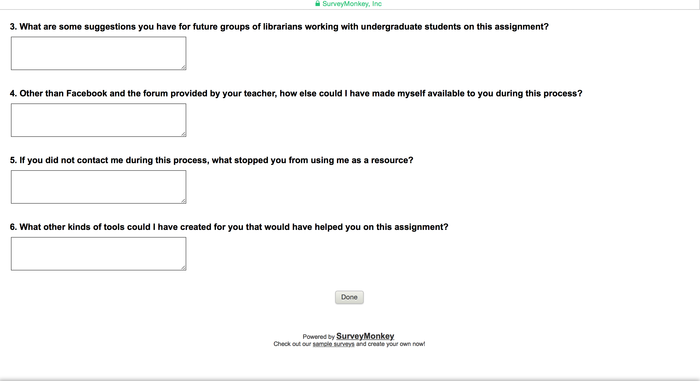 The tool also delves into how to create their bibliography. As simple as these tools were, my students found them to be incredibly helpful. One of my students specifically thanked me for the "How to Search for Scholarly (Peer Reviewed) Journals" tool because he was completely lost on how to start the research process. As of 12/4/14, "How to Search for Scholarly (Peer Reviewed) Journals" has been viewed 51 times. "Citing Your Sources in APA" has only been viewed 26 times. This lets me know that students were using this information, but that the first tool was much more effective than the second. I heard from all of my students at first. Then, there wasn't much activity on the forum. Luckily, two of my students reached out through Facebook. 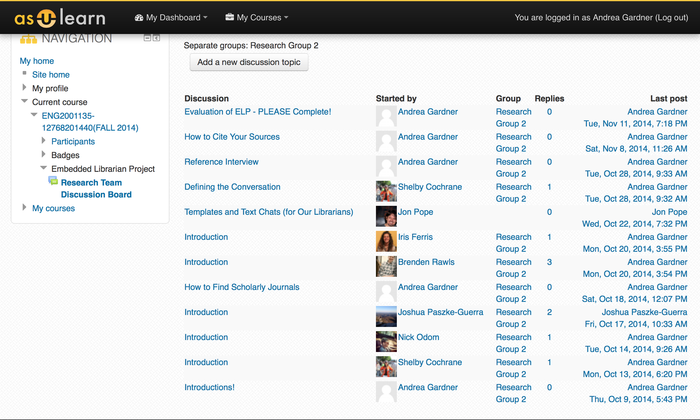 This is how I introduced BI Tool #1: How to Search for Scholarly (Peer Reviewed) Journals. This is how I introduced BI Tool #2: Citing Your Sources in APA. This was also a post on the forum that let students know when my project was over, but that I was more than willing to help them until their paper was due. I only had one other student actively communicate with me. We attempted to have a formal reference interview three separate times, but her schedule was very packed. We continued to reschedule until, eventually, there was a breakdown in communication. The one reference interview I conducted went very well. The student was able to effectively communicate what he wanted to find and what his stance was on his topic. Once he had given me all of the information I needed, I quickly found him a few additional sources. I can only hope that all future reference interviews will be as simple. The most difficult part of the entire interview was narrowing down the topic just the right amount. It was interesting to begin with a very broad topic and have to narrow it down just enough so that you still get good resources, but do not receive all information about the topic that there is out there. With a broad topic like "ethical implications on commercial marketing," there are endless resources. Once Joshua was able to narrow down his topic a little more, finding resources was a piece of cake. Throughout this process, I had two students openly communicate with me. One of them had a more formal reference interview. The other mostly asked simple questions. After finding me on Facebook, Shelby began asking questions about her literature review. Q: I was just wanting to clarify a question I have about the literature review. Should I be separating each of my five sources out or is this like an actual essay where I combine all of my sources in one paper. A: You are reviewing five sources in 2-3 pages. You should have the "politics of cohabitation lit review" to use as a guide. Just be as concise as possible and use APA citation if you quote from your sources. Later, she decided she didn't like her topic. She wanted to run her new topic by me. Q: I'm thinking of doing "how does the media affect elections and campaigns"? Does that sound like a good topic? A: I think that will work a lot better than the original topic. It was a little vague. This is still vague, but we can narrow it down. We then had a conversation about why she changed her topic. Q: Do you think it's ok if some of my research comes from Europe and the UK or does it all need to be US based? A: It depends on the research. If the research is focused on US elections and campaigns, it should be fine, no matter where it comes from, since your paper focuses on US elections. Over the course of this project, these were the only three questions I received from this student. Q: What is the best way to create the references page? Just input everything I know or use a bibliography generator? A: If you trust a bibliography generator, that's fine. I tend to use the reference section of Microsoft Word. Change the citation style from MLA to APA. That should work for you. 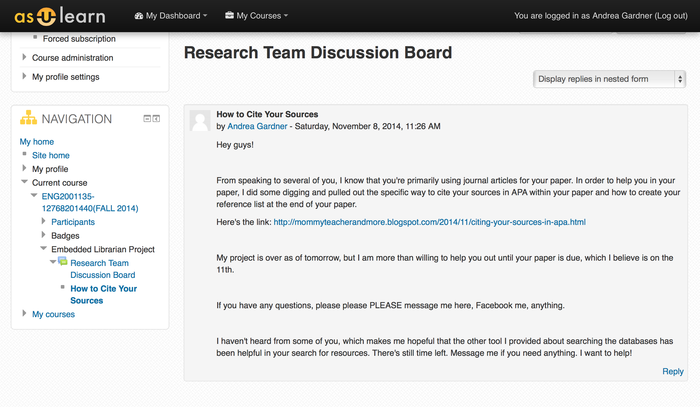 That was the question that led me to create the bibliographic instruction tool on how to cite sources in APA. 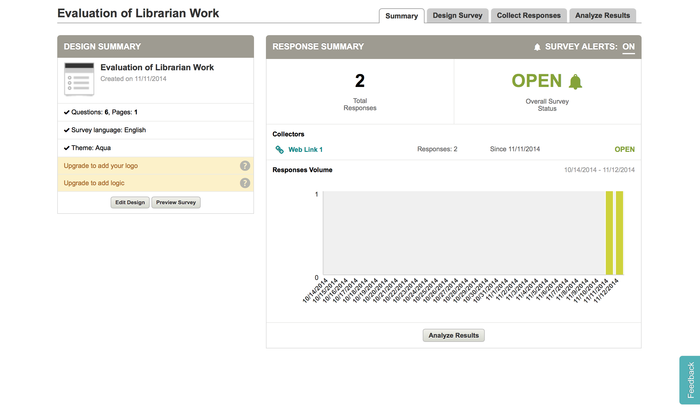 I also got questions on what is more trustworthy - Google or Belk Library databases. How do I find a "peer reviewed" article? What does that even mean? The questions asked were very simple and pretty straightforward to answer. 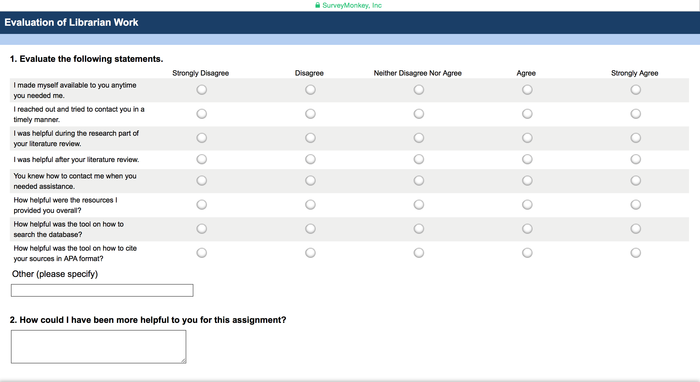 Students answered #1 of the survey. #2 was left blank by each participant. These were left blank by the participants. As you can see, I only received two responses. I assume these are from the two students who actively participated in the project.